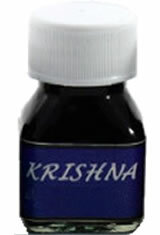 Krisha RC fountain pen inks come with high sheen. These inks were Dr. Sreekumar's first attempt at sheentastic inks. Krisha RC usually are quicker drying. The Krishna RC Fountain Pen Ink usually ships within 1 business day unless otherwise specified. Each Krishna RC Fountain Pen Ink we sell is guaranteed to be genuine, authentic and will arrive brand new & unused! Neither of my Krishna inks look anything like the swabs displayed on Pen Chalet, nor like any of the of the reviews I've seen. I don't know if this is poor consistency from Krishna or mislabeling, but I am extremely disappointed. My Anokhi is a black-maroonish color instead of a purple with green sheen. And my Sea at Night is a boring greyish teal instead of blackish with a red sheen. I love these inks so much. The colors are so rich, vibrant, and unique among inks. The shimmers and sheen are just really lovely. I like the unique combinations such as Pink Brown. My only gripe is that I really wish these were sold in larger quantity bottles. I also think the company really skimps on the labels. The ink inside the bottle more than makes up for it, but honestly, Krishna could do a lot better in their branding department because their bottles, quantities, and labels do not do the ink justice. Krishna inks are all beautiful with sheens and shimmers reflected must more in flex nibs. Pink Brown is more brown than I anticipated but pretty nonetheless. Sea at night is one of the few that reflects a beautiful shimmer even in a fine nib. I'm really enjoying Jungle Volcano. The base color is a really bright orange with red/pink tones, and the heavy green sheen is amazing. It's very smooth, and between the smoothness, vivid color, and sheen, makes me think of Sailor inks, which I consider to be high praise. It's generating a small amount of nib crud, but that's an affliction many orange inks suffer. Sakthy was a pretty color, but I must've gotten a bad bottle. It got super-crusty all over my nib, even on a TWSBI with a cap that keeps even the driest of inks usable. I've noticed that a lot about this brand - very hit or miss. The Anokhi that I bought doesn't sheen much at all, though I've seen reviews around that say it's full of sheen. They're nice colors, but they have some work to do on formulation. FYI - Sea at Night is BLUE with pink sheen, a lot like Organics Studio Santiago Sea Blue. This is not black with red sheen (which would have been amazing). Perhaps I need a broad nib? Maybe a stub? Yes there is a slight color shift and sheen with my M nib Pilot, but darn it.. I'm not getting the shifts like what I have seen other people get with these inks. Don't get me wrong, they are decent inks, well behaved in every pen I have tried them in, but dang it.. I'm crazy about Krishna inks. They are free flowing so they shade and/or sheen very well. And the colors are slight deviations from the standard hues. I own seven now, and I wish I'd ordered them all from Pen Chalet since they have the best prices even w/o the discount or the free ink program. I recommend Jungle Volcano, Sakthy, and Vaikhari sheening properties. But yellow valley (yellow black) and Thulsi are great shading inks as well. They're hand made in small batches, really worth the $ in writing fun. The bottles are cute, but you may want to get a syringe for the easiest loading once you get toward the bottom.